Ask if he's down with O.P.P. If you need an indication of how sure Hollywood is about the bankability of a family film, look no further than the “SNAF” (sequel nobody asked for) kid flick The Nut Job 2: Nutty By Nature. While the 2014 original didn’t set the world on fire (the total box office take can best be described as “meh”), studios know that Moms and Dads are desperate for anything that will keep the wee ones occupied. But instead of delivering something original (Pixar) or fun (Captain Underpants), they’ve come up with a rote retread that tells the same old stories in the same old hackneyed and dull way. This is another of those “former enemies bad together to become allies against something worse” narratives where evil wrings its hands and twirls its mustache while good drops pop culture bon mots and runs around in one pointless, seizure-inducing action sequence after another. There’s no character development beyond the basics (he’s a rebel, he’s a know-it-all, she’s got a good heart) and the visual design argues less for supercomputer level CGI and more for those notoriously bland ’80s Saturday morning cartoons. Still, someone thinks you will show up with their offspring in hand, coughing up the coin they have already predicted and are now relying on. Our “hero” from the first film, spunky squirrel Surly (Will Arnett), is forced to find a new place for his extended family to live in when the nut warehouse they called home blows up. They decide that Liberty Park might provide some nice new digs, but there’s a problem. The mayor (Bobby Moynihan) wants to bulldoze the preserve to make way for a far more profitable–and highly suspect–amusement park. Along with his gal pal Andie (Katherine Heigl) and pug dog Precious (Maya Rudolph), he seeks to rally the residents and revolt. Their secret weapon. A rodent named Mr. Feng (Jackie Chan) and his well trained army “of mouse destruction.” Get it? 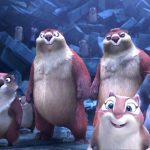 Unlike the first film, which tried to tie its juvenile narrative to the old noir heist flicks of the ’40s and ’50s, The Nut Job 2 is more concerned with animation basics than anything inventive. Even the inclusion of Chan’s martial artistry is minimized by (a) his lax grasp of English, and (b) the lack of his physical presence and kung-fu grace on the screen. As cute as Mr. Feng is, a cartoon mouse can’t take the place of the Asian superstar. In fact, most of the movie suffers from a lack of personality. The character voices are generic, with Arnett sounding so bored and uninvolved that your fear Surly will fall asleep in mid scene. Only Rudolph redeems herself, turning Precious and her new boy friend Frankie (Bobby Cannavale) into the only intriguing elements. As with most modern animation, director Cal Brunker is obsessed with delivering over the top spectacle. There is no subtly in the opening sequence, where nuts reign supreme to the several action sequences that rival Michael Bay with visual bombast. Sure, rodents vs. bulldozers deserve a certain level of indulgence, but The Nut Job 2 doesn’t earn the outsized experience. The material in between the bedlam is so dull and drab that the colorful chaos feels like an alarm, meant to do little but wake the wee ones up. Still, this remains an obvious attempt to turn Mom and Dad’s date night into an ATM, a way of keeping the kids occupied while the adults do something more meaningful. 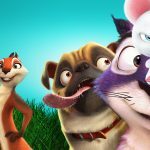 The Nut Job 2: Nutty by Nature is not The Emoji Movie awful, but it’s not good either. It’s just a repetitive, redundant mess. 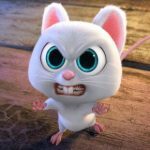 Pingback:Псих 2: Психованный По Натуре | Кино Новости.